Before we begin: these changes are layered on top of what you saw the last time U.R.F. was around. Buffs, nerfs, and updates have happened since, so we’re adjusting accordingly. First up: slowing down a few cases of perma-CC. If you think about it, “perma-living” is a very similar issue, hence the following two changes. Last, bonus buffs for a few of the aforementioned anti-URF champs who don’t benefit as much from the Awesome Buff of Awesomely Awesome Buffing. Ultra Rapid Fire is now available and lasts through the evening on Sunday (we’ll shut it down very early Monday morning--around 3:00 AM AEST). 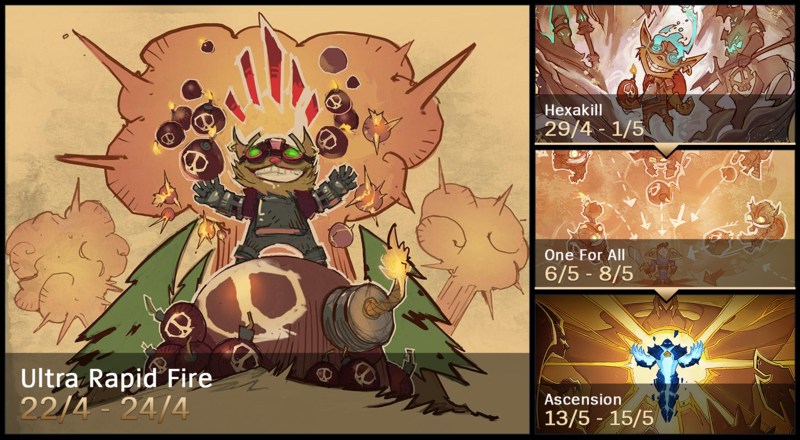 We’ll be trying out different things with the rotating game mode queue over the next few months, such as potentially turning it on longer depending on how popular it is, changing the mode cadence or what modes are available. We’re looking for your feedback as we go, so let us know. GLHF, and we’ll button-mashing alongside you during this ultra rapid weekend!